Greetings from The 88 Project! We are bringing you news, analysis, and actions regarding human rights and civil society in Vietnam during the week of April 1-7. Phan Kim Khanh is facing retaliation from authorities over his protests for them to send letters pertaining to his appeal of his sentence. Journalist Le Anh Hung was transferred to a mental health facility this week as he still awaits trial for “abusing democratic freedoms.” Political prisoner Nguyen Nam Phong’s family is suffering as they try to pay for medical treatment for his eldest daughter, who was diagnosed with cancer. Tran Hoang Phuc has helped win some expanded rights for prisoners. Nguyen Ngoc Anh was able to meet with his family for the first time since being imprisoned seven months ago; his wife, though, was questioned only days prior about her involvement with two groups that provide support to families of activists and political prisoners. Huynh Truong Ca’s wife was also questioned for her relationship with one of the same groups. This week, we remember the ten activists sentenced to a combined 96 years in prison in April 2018. Read our analysis and updates on some of the prisoners, here. We also remember those affected by the Formosa environmental disaster, including political prisoners jailed for speaking out against it. The disaster began three years ago, on April 6, 2016. In the news, read local reactions to the extradition of former political prisoner Nguyen Quang Hong Nhan from Germany, as well as a reflection on Vietnam’s one-party state, and the prospect of another US aircraft carrier visit to Vietnam. In case you missed it, the US State Department released its 2018 Country Report on Vietnam in March. And consider taking action for Vietnamese political prisoners by making a donation to the Conscience Fund. Le Anh Hung’s mother, Tran Thi Niem revealed that the investigation agency suddenly transferred Hung to the Central Mental Hospital (the article in Vietnamese, here) in Thuong Tin District, Ha Noi, on April 1, 2019. On the morning of April 4, Niem, Hung’s bother, and a friend of Hung went to visit him but were denied access. The investigation agency said that they were checking on Hung’s health and waiting for the result. His mother was only able to send him some money. Hung had protested against wearing handcuffs and a prisoner uniform, as he has not yet been convicted of any crime. He is still under pre-trial investigation under Article 331 of the 2015 Criminal Code (“abusing democratic freedoms”). Hung, a writer for many outlets, including Voice of America, is a member of the Independent Journalists’ Association and was arrested on July 5, 2018. Nguyen Nam Phong has been in prison for over a year. He was the main financial supporter of a family with three children. Phong and his wife’s eldest daughter, who is a ninth-grader, has been diagnosed with cancer, causing her a bruised and painful right leg. A week ago, doctors advised the family to amputate her leg to extend her survival, which would make the situation even harder for the family. Therefore, many are calling for help for Phong’s family in overcoming this difficult situation. Phong was the driver for peaceful labor and environmental activist Hoang Duc Binh when Binh was arrested in May 2017. Phong was sentenced to two years in prison and has been badly beaten there and made to perform forced labor. A month after an argument between the Vice Captain of the Detention Center, Truong Viet Hung, and political prisoner Tran Hoang Phuc, as well as his family, Phuc’s family was able to visit him and send him some food on April 5, 2019. Phuc shared that the detention center gave him and other political prisoners some additional rights, which Phuc and his family have been continuously petitioning for for more than seven months. They allowed Phuc to receive his own blanket, pens, books, and notebooks and to call his family. Authorities also gave prisoners two more television channels to watch. 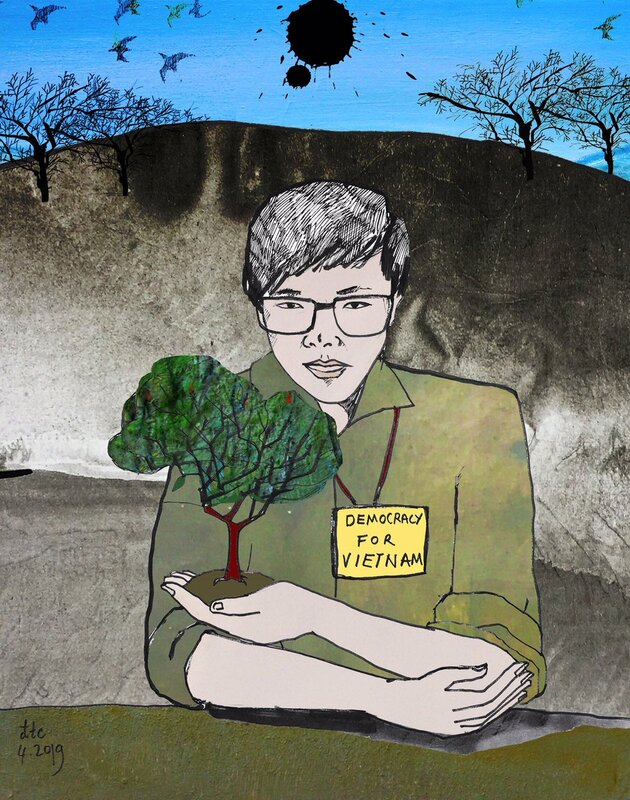 Before ending the visit with his family, Phuc confirmed that he and others have continued asking for even more rights in prison.Tran Hoang Phuc is an award-winning student who was prevented from graduating from law school in 2016 because he spoke up about environmental issues like the Formosa environmental disaster. He is also the founder and President of the Vietnamese Students for Human Rights Association. He was sentenced to six years in prison for helping fellow activists store and post video clips with democracy and human rights content. On March 29, political prisoner Nguyen Ngoc Anh’s wife reported on her meeting with security forces. She was questioned about the “50k Fund” and “Environment Fund”, organizations that were established to support poor families affected by the harassment or imprisonment of a family member, as well as money that she received from these groups. All the questions were allegedly to find out more about her relationships and her financial situation. It appears that the 50k Fund is currently under scrutiny by security forces. On April 4, 2019, Nguyen Ngoc Anh and his family were finally able to meet after more than seven months. He revealed that his health was not good during the first four months in prison, but it has improved. His spirits have also lifted recently. Anh encouraged his wife not to worry about him and to be strong. He said he knows what to do in prison, and that he is not lonely. The visit with his wife and son brought him much joy. Nguyen Ngoc Anh was arrested in August 2018 for raising his voice about national issues online. He is under pre-trial detention on the charge of “making, storing, spreading information, materials, items for the purpose of opposing the State of Socialist Republic of Vietnam” (Article 117 of the 2015 Criminal Code). On April 2, 2019, Dong Thap Public Security sent an “invitation” to Pham Thanh Tam, political prisoner Huynh Truong Ca’s wife, to also question her on issues relating to the 50k Fund. Huynh Truong Ca is co-founder of the Hien Phap constitutional rights group and was sentenced to five years and six months in prison in December 2018. He’s suffering from numerous health issues while imprisoned. This week, we remember the ten activists sentenced to a combined 96 years in prison in April 2018. A year later, seven of these ten activists remain in prison. They are from all parts of Vietnam, of all ages, and of varied backgrounds. They have been transferred to remote prisons, suffered from health ailments, had appeals of their sentences denied, and one was even allegedly forced to give false testimony against another activist. In this article, we update you on the some of the remaining prisoners’ current conditions and reflect on the human rights situation in Vietnam in the year since the trials. This week marks three years since the start of the Formosa environmental disaster, a massive toxic waste spill that left thousands without jobs and with polluted coastlines and food sources. For a timeline of events, check out this resource from The Vietnamese, here. We remember the many who are still dealing with the aftermath of the catastrophe, the activists who continued pressing for change, and the dozens of political prisoners sitting behind bars for their reporting on the disaster, their efforts to help affected communities, and their commentary online. Some of these prisoners are: Nguyen Van Hoa, who live-streamed footage of Formosa protests, Le Dinh Luong, Tran Thi Nga, and Ho Van Hai.